I've been a fan of the work of Aardman Animations ever since I first watched Morph and Tony Hart as a child. Subsequently I've seen all of the Wallace and Gromit animations and I like to keep an eye on, though not always watching, their other animations. Now do you remember A Close Shave? Do you remember the ballsy sheep, Shaun (great pun there), who turned out to be quite a star in that animation? Well he went on to star in his own CBBC TV series - Shaun the Sheep - and now his cousin, Timmy, who lives in the field next door, has his own TV series too - Timmy Time. Timmy Time is all about the trials and tribulations of being under four. Timmy experiences the highs and lows of daily life at nursery, learning to share, learning to work as a team, being kind and helpful and owning up when you’ve made a blunder. 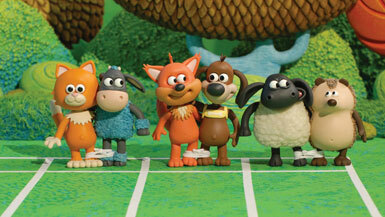 Timmy has a whole host of furry and feathered friends who help, and hinder, his adventures. Well, I can say I've now watched EVERY (3 of 52) episode of Timmy Time and I think it's brilliant. It's its simplicity that makes it so good. There are no words at all, however like Pingu, you understand exactly what each of the characters means when they talk in their "native tongue" which in itself is a great and clever idea. I think this is a brilliant way to introduce toddlers to the differences between people. Each animal at Timmy's nursery speaks its own "language"; for example the cat meows, the pink oinks (when he's not stuffing his face - hidden message there? ), the dog woofs, the duck quacks and the owl hoots. It's great, and very cleverly done. What's more, each episode is only 10 mins long, which is great for small attention spans, and has a little message that the kids can learn from, without treating them like complete imbeciles and spelling it out for them. Claire has passed on my recommendation to Fiona and Alan for Elizabeth to watch. Like all the adults, she's not going to be able to watch it at 9am when it's on on CBeebies, but she can watch it on iPlayer when she gets in from a hard day at play school. For the adults: it's a great excuse to grab a coffee, clear your mind and unwind for 10 mins each day.